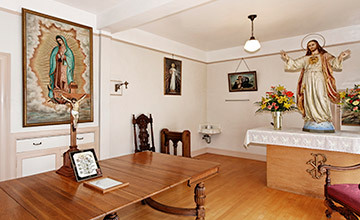 By late September 1928, the large house on Ashbury that we had arranged to purchase was completely vacant, so Mother Gertrudis could better accommodate all the Sisters and above all, use as a chapel the gracious living room (now the large visitors' parlor), which was tidied up and appointed with appropriate furnishings and décor. We were finally experiencing our communitarian life, our contemplative and cloistered vocation, although we were making adoration with the Most Blessed Sacrament hidden in the sacristy while we were finishing the preparation of everything necessary in order to hold the Solemn Exposition. Thus arrived September 29th, 1928, which in the loving plan of God was the day on which the Solemn Exposition of the Most Blessed Sacrament first began in our monastery in San Francisco. On November 7th, 1928 seven more Sisters arrived from Guadalajara, and we were able to begin a regular community life. Father Cunningham, S.J., was named our confessor, and a Mexican priest, Father Delgadillo, was named our chaplain. They were the first to offer their charity in these services which were so indispensable for us. Soon afterward, Father Delgadillo had to return to Mexico, and he was succeeded as chaplain by Father Alberto Navarro, who belonged to the diocese of Michoacán. Cardinal Charrete, the Cardinal Protector of our Order, visited us in San Francisco, accompanied by the Archbishop of San Francisco, Monsignor Hanna. Mother Gertrudis took advantage of the occasion to share with these distinguished people the pending projects of the community. We were left very happy and grateful to Our Lord for such a singular benefit because we would never have imagined that we could meet our Cardinal Protector, much less find in him such simplicity and humility; we prayed to God that this meeting would benefit the community. Meanwhile, we continued to reap the benefits of the inexhaustible charity of our Father Kavanaugh, who never ceased to speak of us among his friends, recommending that they help us, which they did with great generosity and perseverance; even today, we continue receiving in abundance the charity of the inhabitants of this city of San Francisco, CA. In May 1929, Father Mariano Cuevas, SJ, who was collecting information for his work The History of Mexico, came to the city of San Francisco. 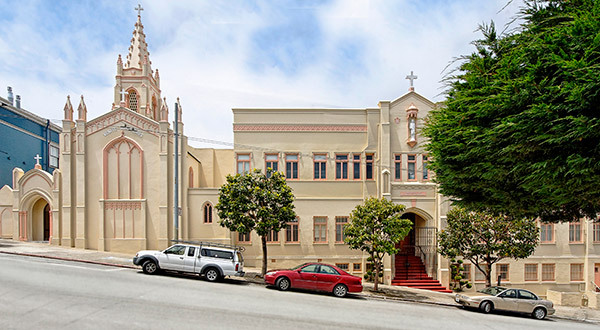 Father Kavanaugh took advantage of this occasion to invite him to lead us in Spiritual Exercises; Father Cuevas kindly accepted despite not generally participating in this ministry, and our first exercises in San Francisco were thus very beneficial thanks to God. Our financial situation was very difficult due to the losses caused by the bankruptcies of the places where we had deposits; the little money that remained was invested in the purchase of the house on Ashbury Street and those on Downey Street. Consequently, we quickly tried to look for ways to support ourselves. We worked making paintings and all kinds of handicrafts, which our clients always admired, being so pleased that on occasion when we submitted our work, they generously gave us more than the specified price. They also greatly enjoyed our baked goods and Mexican snacks such as tamales and enchiladas. We did this type of work for a long time in order to pay for the considerable expenses involved in a community as large as ours was. We could also feel God's Providence manifesting itself in the spontaneous and generous charity of the Americans, charity which continues to this day; we feel immense gratitude towards this generous and magnanimous country, and we are always asking Our Lord to spread His abundant graces and blessings over it. Little by little, necessary construction work was being completed, such as connecting the various houses which together formed the monastery. The first benefactor which Divine Providence sent us was Mrs. Doyle, who with great generosity gave us forty chests of drawers and forty night tables which even today still form part of the furnishings of our cells. Father Richard Bell gave us a monstrance which we still use in the daily exposition of the Most Blessed Sacrament. The previous owners of the houses we bought also gave us some of the furnishings inside them, all of which were of very good quality and very useful for us. In 1935, Mrs. Rose C. Wohlfrom gave us the house next to the one we had already bought on Ashbury so that we could construct a chapel there. Among the people who often requested our handicrafts and baked goods was Mrs. Julia Laveaga de Welch, who always paid more for our embroidery than the price we had specified, and who in time became one of our greatest benefactors. Inspired by the donation made by Mrs. Wohlfrom, she decided to help us with the construction of the chapel, which began in 1936. She herself chose the engineer in charge of the project, Mr. Foley. Many people collaborated on this project, but she always took the lead role. At the beginning of the year 1937, the work on the chapel was close to completion. The decoration of the entrance hall began and Mother Gertrudis came to see it; she was delighted. The chapel itself still needed to be decorated, but Mother Gertrudis did not live to see this; she passed away on February 13th, 1937. On June 8th, 1937, the Solemn Benediction of our chapel and the consecration of the altar by Archbishop John J. Mitty took place. It was blessed with the title "Corpus Christi," but it is generally known under the name "The Chapel of the Most Blessed Sacrament." After this, Mrs. Welch decided to help us renovate the façade of the entire monastery on the Ashbury street side. A very beautiful and slender tower was built for the chapel and the vistors' parlors, sacristy, and entrance hall were all arranged much as they are today.